The Chinese icebreaker Xue Long, or Snow Dragon, was just six nautical miles away from the rescue, but now it's stuck in an Antarctica ice floe, too. 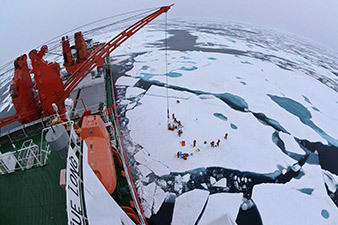 But it's likely the French vessel Astrolabe will also be slowed by the polar cap's extreme frigidity, Zhu said. Those two icebreakers -- plus a third, from Australia -- were battling the planet's coldest environment in trying to reach the stranded Russian ship MV Akademik Shokalskiy, whose 74 researchers, crew and tourists remained in good condition despite being at a frozen standstill since Monday. It all shows that some lands -- especially the ends of the Earth -- will never be tamed. The Snow Dragon is in near-constant communication with the Russian exploration vessel and has ample supplies of water, food and medicine -- even a helicopter -- if the ice-bound Shokalskiy needed them, Zhu said. The Russian expedition ship is carrying scientists and passengers led by an Australian climate change professor, but they all may have to wait two more days for one or all three icebreakers to free it, said Capt. Wang Jiangzhong of the Snow Dragon. "Right now we are waiting for winds to blow ice away so we can move closer," Wang told CNN. "The current ice condition is exceeding our capabilities to break through further." The captain also acknowledged his ship may need help from the other icebreakers headed to the area if conditions deteriorate. "We are in continual communication with the (stranded) ship," he said in a satellite phone call with CNN. "I think it's at least a form of emotional relief for them to know we are nearby to help. We know that they (passengers) are all doing well on that ship." The Aurora Australis out of Australia is two days from the Russian ship, its captain, Murray Doyle, told CNN on Friday. China's State Oceanic Administration said the Xue Long sailed through an intense cyclone to reach the Akademik Shokalskiy sooner. Meanwhile, spirits were high Friday aboard the Akademik Shokalskiy. "The vessel is fine, it's safe and everyone on board is very well," expedition leader Chris Turney, a professor of climate change at University of New South Wales in Australia told CNN. "Morale is really high." It got stuck in the ice on Monday night -- 15 days after setting out on the second leg of its research trip. According to Turney, the ship was surrounded by ice up to nearly 10 feet (3 meters) thick some 100 nautical miles east of the French base Dumont D'Urville, about 1,500 nautical miles south of Hobart, Tasmania. On Christmas morning, the ship sent a satellite distress signal after conditions failed to clear. The crew had a "great Christmas" despite their situation, Turney told CNN earlier. He said crew members have used the delay to get more work done. "We've just kept the team busy," he said. The expedition is trying to update scientific measurements taken by an Australian expedition led by Douglas Mawson that set out in 1911. Turney said the ship should still be back in New Zealand on time.